Registration leads to confiscation. When Canada started to confiscate Canadian rifles, Canadians tried to play “Mr. Nice Guy”. The news anchor in this video warns Americans to avoid making the same mistake. The people in positions of power in Washington DC no longer represent the best interests of the American people and therefore can no longer claim to be the “American government”. Thus, it’s not really the “American government” that wants Americans disarmed–it’s the same group of globalists that wanted Canadians disarmed. It’s the New World Order that wants you disarmed. And they’ll probably have their way, unless the American gun-owners stop playing “Mr. Nice Guy” and instead tell all gun control to stick it up their arse and shut their G.D. mouths. Larken Rose has struggled against the government for a decade or more. His resistance initially focused on the IRS and caused him to be imprisoned for several years. Since his release, his determination to resist government oppression is not only undeterred, it’s enhanced. Here’s a video by Larken that may make you squirm. The video’s title (“When Should You Shoot A Cop”) is beyond any concept of political correctness. The title is shocking and poses a question that most Americans are afraid to ask let alone consider. I suspect that Laken’s question may inspire fear in most Americans. I also suspect that if our reluctance to confront the question is inspired by our fear of the police and “official oppression,” then our reluctance is evidence of how important it is that the question be openly asked, considered and answered. Tags: Larken Rose, When Should You Shoot A Cop? You can’t have a police state without massive, central government computers. The fascist governments of the western world are absolutely dependent on their computers to maintain control over their people. However, that dependence creates a problem: increased access to the governmental computers. For example, the police have computer terminals in most police cars that allow officers to have instant access to local, state and national data bases stored on distant computers. The multiplicity of computer terminals makes it fairly easy for “hacktivists” to also access and “hack” into the police computers. 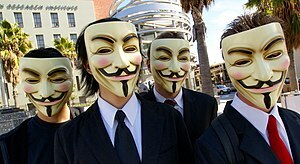 The more a government relies on computers, the more easily government computers can be “hacked” into. A man in Austin, Texas sees a woman being abused by the police. He videotapes the abuse. The police see him videotaping, come over and arrest him, claiming 1) he was interfering with a police investigation; and 2) that he spit on the officer. Unbeknownst to the police and even the first videographer, a second citizen-videographer tapes the police arresting the first videographer. Later, the first videographer advertises on Craig’s List for anyone who witnessed his arrest. The second videographer sees that ad and supplies his video of the event. The second video refutes the police version of the arrest. Local TV stations pick up the story. I don’t know how many cops would like to outlaw firearms, but I’ll bet a bunch of ’em would like to ban video cameras. 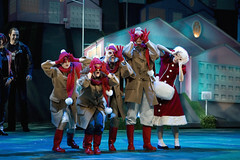 Watch ’em infiltrate the Bank of America with caroler’s costumes. It’s Christmas and these carolers look harmless.